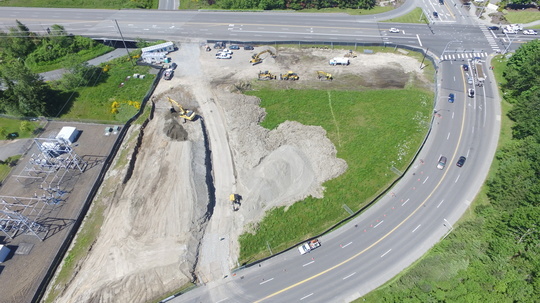 An aerial view of the Seaway Transit Center construction site shows excavation has begun. Construction on the Seaway Transit Center in south Everett is in full swing. Construction crews began heavy excavation this week, removing dirt from the site that will cause some traffic disruptions on 75th street. Here is what to expect during construction on 75th. Now through mid-July: Single lane closures in both directions from 7 a.m. to 5 p.m. on weekdays. Periodic all-lane closures from 8 a.m. to 1 p.m. for construction trucks entering the road from site. Watch for flaggers on roadway. Early June: Sidewalk on south side of 75th between the Everett Transit bus stop and PUD substation will close for duration of road construction. Use sidewalk on north side of 75th. Late July: Lanes on 75th will be narrowed and restriped in order to begin construction of entrances into the Seaway Transit Center near the PUD substation. Early August: Everett Transit bus stop will close. Riders will be alerted where to catch the bus. Seaway Transit Center will be the northern terminal for the Swift Green Line, but will also be a regional hub for Paine Field-area transit service when it opens in mid-to-late 2018. Construction schedules are subject to change. This project involves creating new right travel lanes on 128th Street at the approach to I-5, one on each side of the freeway. Construction on this project is scheduled to start this June and wrap up by the end of the year. These lanes will save buses 3-7 minutes, while also providing a benefit to general purpose traffic. Now - early June: PUD will be relocating light poles on northeast side of I-5 on 128th near the Quality Inn and Suites. Mid-June: Construction begins on widening of 128th Street on southwest side of I-5. Expect right lane closures from 8 p.m. until 5 a.m. Sundays through Thursdays for duration of project. Late summer: Construction crews will move to east side of I-5 to begin work on 128th widening. Community Transit is issuing a bid to build the Swift Green Line stations along the route. June: Bids accepted to build stations. Mid-Late Summer: Bidder selected and approved. Late Summer: Swift Green Line stations and road improvement construction begins. This project involves construction of the 31 Swift stations and road improvements along the Swift Green Line route (see map below). Community Transit construction plans include special efforts to minimize disruptions to traffic, businesses and residents, including night- and weekend-only work for much of the 128th St. and Swift station heavy construction. Swift is Community Transit's Bus Rapid Transit service. 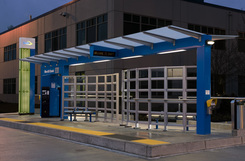 Washington State’s first bus rapid transit line opened in November 2009. The Swift Blue Line serves a 17-mile route between Everett and Shoreline. It provides fast, frequent and reliable service whether you are traveling from Everett to Lynnwood, Edmonds to Shoreline or anywhere in between. The Swift Green Line will serve a 12.5-mile route between Paine Field/Boeing and Canyon Park/ Bothell. It is expected to begin service in early 2019. The Swift Green Line will provide appealing choices for people to travel without a car. Because stations are further apart and fares are paid at the station, Swift buses offer rail-like quickness. Not only will this route offer fast, frequent service to those living or working between Bothell and Boeing, but the connection to the Swift Blue Line will greatly expand the ease of transit use in our region. 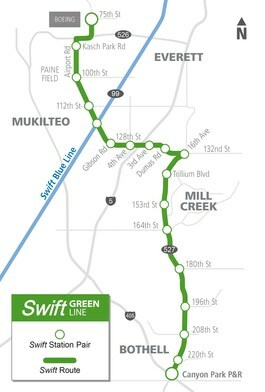 The Swift Green Line will cross the Swift Blue Line at Airport Road and Highway 99, establishing a Swift network. More Swift lines to the north and east of our county are planned for the future.